With basic facility improvements, any size community can benefit economically from youth sports tourism. Weekend tournaments used to be a local affair, where participants would go home at the end of the day’s events. Today, athletes and their families often travel to multi-day sporting events, generating $7 billion in direct sales and tax revenue for host communities. These events have redefined tourism. “Tourna-cation” is a new word that describes a family vacation planned around a youth tournament. Some cities attract events with multi-million-dollar facilities built expressly for youth sports. But thanks to the growing popularity of travel teams and regional tournaments, any community can make small investments and turn its existing stadium, park, or civic center into a destination spot. Add value to your entrance sign. 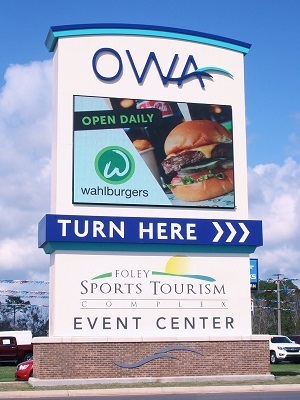 A static sign identifies your venue, but an LED digital sign does much more. With dynamic content, you can welcome specific teams, give bracket updates and promote future tournaments and camps. Watchfire’s Ignite software makes it easy to schedule messages months in advance, reducing weekend staff and make fast changes for last minute updates. DO SOMETHING TODAY: Discover how many people pass by your facility every day. Request a free traffic analysis. Put housekeeping first. Make sure the turf is trimmed, the court is polished, the fence is painted, and the bathrooms are spotless. While easy to ignore, facility maintenance is the easiest improvement you can make. Create a stadium or arena that make fans and athletes feel comfortable and safe. DO SOMETHING THIS WEEK: Conduct a facility audit. Find at least one improvement that can be made with existing staff and resources. Build a lounge. Offer players and families a place to rest and regroup in between matchups. Add comfortable seating, high profit margin vending machines and an LED video wall to an underutilized area. These areas can often double as conference rooms and tournament headquarters. They can also generate revenue by selling naming rights and signage. DO SOMETHING THIS MONTH: Using painter's tape, brainstorm areas that can be repurposed. Take photos. Guarantee Internet access. Generation Z athletes (born between 1995 and 2005) and their parents expect mobile or wi-fi Internet access at tournament venues. Many event organizers require wi-fi for cashless concessions, e-tickets and web broadcasts. Adding features like charging stations can give your facility a competitive edge for the next RFP. Other tournaments will have families who are happy to pay $9.99 to the facility for a day of unlimited access. Beware of wi-fi interference caused by poor audio and video equipment. All Watchfire displays and scoreboards are FCC complaint and will not interfere with cell phones, Bluetooth® headphones or wi-fi routers. DO SOMETHING THIS WEEK: Determine Internet access currently available inside and outside of your venue. Record the reception and data speed of major mobile carriers. Add “pow” and profit with a video board. When professional teams renovate facilities, they lead with news of their new state-of-the-art video scoreboard. After all, video boards are profit centers that engage fans. They have become affordable and hassle-free options for amateur sports too. Messages that display mascots and player profiles give cities a leg up when competing for an event. Team-specific content also sparks social media posts. Watchfire sports displays have faster refresh rates, so cell phone photos and videos taken of your display will look great. A Watchfire video scoreboard paired with Ignite Sports scoring and event software turns any venue into a multi-sport facility. Choose new content to make a basketball field house feel like a hockey arena. Ignite Sports adds sponsorship flexibility too. Update advertising in seconds, earning new revenue with each new sport and event. DO SOMETHING TODAY: See what revenue is waiting for you. Download our free ROI calculator. Youth tournaments are the fastest growing segment of the tourism industry, stimulating local economies. To compete, municipalities must meet player and family expectations. Call today and discover how a Watchfire sign or scoreboard fits into your tourism destination management and community development plans.